In May, 36 percent of Jetta sales were diesels, up from earlier in the year. The dramatic decline in diesel fuel prices is driving up U.S. sales of diesel-powered vehicles from European carmakers. Volkswagen dealers across the country say they can't get enough of the Jetta TDI sedan or station wagon. "Things have changed, and diesel Jettas are moving. I want more," says Casey Gunther, owner of two VW stores in Fort Lauderdale, Fla.
German automakers as well as suppliers such as Robert Bosch GmbH are hoping that the arrival of new, clean diesels will lead to a sharp increase in demand in the United States, where diesels account for a fraction of total sales. In Europe, diesels outsell gasoline-powered cars. On Tuesday, June 16, the average U.S. price for a gallon of diesel was $2.60, according to AAA. That compared with $2.67 for regular unleaded gasoline and $2.94 for premium. A year ago, when diesel hit $4.85 a gallon, European manufacturers wondered how they would sell their new crop of 50-state diesel vehicles, which began arriving last year. VW, Audi, Mercedes-Benz and BMW all sell 50-state diesels in the United States. 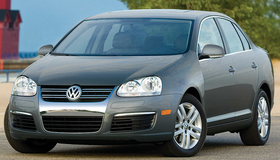 Volkswagen sold 3,862 diesel Jettas in May, up from 2,253 in April. "We would expect equal or higher sales of diesels this month," a VW spokesman says. About 36 percent of total Jetta sales in May were diesels, compared with an average of 30 percent earlier in the year, the spokesman says. Volkswagen says demand for the Jetta SportWagen is particularly strong. Richard Fisher, whose Autobarn dealership group has three VW stores in the Chicago suburbs, says he has "pretty much run out" of TDI station wagons. Mercedes-Benz sold 8,242 diesel-powered M-class SUVs from January through May, or 16.5 percent of the total for the vehicle. For all of last year, the diesel version accounted for 13.7 percent of M-class sales. Through May, diesels accounted for 21.8 percent (5,440) of Mercedes GL sales and 15.1 percent (1,312) of R-class sales, up from 13.7 percent for the GL and 10 percent for the R class in 2008.